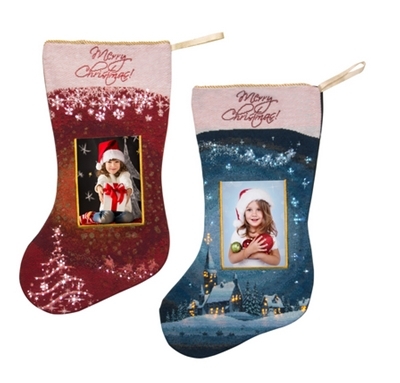 • Each ''Light-up'' Stocking holds a 4x6 photo and hangs 18'' long. • A unique fiber-optic blinking lights woven throughout with gold stitching. • Comes in Red or Blue with a Merry Christmas on top. • A Christmas tree and snowflakes is featured on the red stocking that lights up. • A chapel and stars is on the blue stocking and light up. • A velcro pouch inside holds 3 AAA batteries NOT INCLUDED.